WHAT IS THE LATEST AND GREATEST DOCUMENTARY ON IMMIGRATION?? 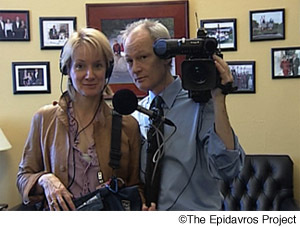 More than a decade ago, award-winning filmmakers Shari Robertson and Michael Camerini sat down with me and passionately outlined their vision for a documentary that would illustrate how democracy works, at least in Washington, DC, by capturing the inner workings of Congress in cinéma vérité style as legislators debated and passed a sweeping immigration overhaul. Little did they — or the rest of us — realize that the momentum in the fall of 2001 that foretold of swift passage for the first major overhaul of the US immigration system since 1965 would come to an abrupt halt with the terrorist attacks that pierced America’s sense of invulnerability. What was to have been a one-year project, using the immigration debate as the lens through which to explore the legislative process, stretched into six years as Congress, in fits and starts, debated and shelved major immigration legislation. Though the country is the poorer for the lack of action to fix what is near universally decried as a broken immigration system, the films that Shari and Michael have created after more than 1,400 hours of filming and thousands of hours in the editing room tell an endlessly fascinating — if frustrating — tale about modern politics, the powerful constituencies assembled for and against immigration reform, and the forces that keep Washington stalemated on so many complex and contentious policy questions vital to our nation’s future. The documentary series grants viewers a rare “fly-on-the-wall” perspective as legislators such as Senators Ted Kennedy (D-MA) and Sam Brownback (R-KS) negotiate; advocates press their case; and constituencies align, come apart, and reconfigure themselves. With equal vividness, the films also portray how the failure of action on immigration reform at the federal level allowed the states — several of which have since enacted tough and what many call unreasonable immigration enforcement laws — to become immigration policy and political battlegrounds. As such, How Democracy Works Now offers a valuable civics lesson and insight into the political world and, in particular, the immigration policymaking process. Because we believe these films represent a rare and important education, we are offering readers of the Migration Information Source a Q&A this week with Shari and Michael, who may be known to some of our audience as the creators of the influential Well-Founded Fear documentary on the US asylum system. Later this month, we’ll publish an essay in which they recount their initiation into official Washington’s tribal-like customs, explain how they secured behind-the-scenes access denied to the media and others, and offer some hard-earned observations about immigration policy and the ability to effect change.